Alice S. Rossi served as the 74th President of the American Sociological Association. Her Presidential Address, entitled “Gender and Parenthood,” was delivered at the Association’s 1983 Annual Meeting in Detroit,and was later published in the American Sociological Review (ASR February 1984, Vol 49 No 1, pp 1-19). Rossi was born in New York City in 1924. She earned her undergraduate degree from Brooklyn College in 1947. She married Peter Rossi in 1951 (see separate profile on Peter Rossi, who died in 2006). She earned a PhD from Columbia University in 1957. She started teaching full time in 1959 at the University of Chicago where she remained until 1967. She joined Johns Hopkins University in Baltimore in 1967. She was on the faculty of Goucher College in Baltimore from 1969 to 1974. She joined the faculty of the University of Massachusetts – Amherst in 1974 where she worked until her retirement in 1991. She died in Northampton, Massachusetts on November 3, 2009 at the age of 87. The New York Times reported “In her scholarship, Professor Rossi explored the status of women in work, family and sexual life.” She is remembered for much of her work, including the book The Feminist Papers: From Adams to de Beauvoir, which was originally published in1973. 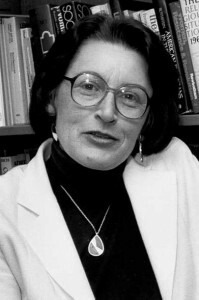 Rossi was a noted feminist scholar who was a founding member of the National Organization for Women. “In 1964 I wrote an article in the journal Daedalus called ‘Equality Between the Sexes: An Immodest Proposal.’ By later feminist standards my argument for equality was mild indeed, but the reaction of traditionalists in 1964 was not. I was considered by some a monster, an unnatural woman, and an unfit mother. My husband, also a sociologist, received an anonymous condolence card lamenting the death of his wife. My theme was simple enough. For the first time in known history, I wrote, motherhood had become a full-time occupation for adult women, and motherhood was not enough. For the psychological and physical health of mother and child, for the sake of the trembling family unit, and for the progress of society, equality between men and women was essential and inevitable. A necessary correction to this bio. Alice Rossi was denied full time teaching positions at the University of Chicago and John’s Hopkins even after her reputation as a scholar and activist had been established. 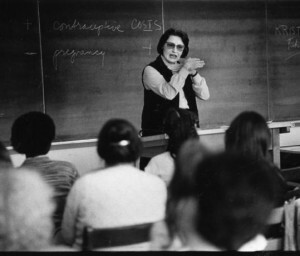 Her first full time faculty appointment was at Goucher College.Her first and only appointment to a graduate faculty came when the University of Massachusetts/ Amherst hired her in the early 1970s.It is not so long ago that the academy was inhospitable to women, even those who had established well earned reputations.